I created this card for a friend’s daughter who’s birthday was coming up. She had asked her Mom for Copics for her birthday. I thought that was an awesome gift. Her Mom got her a pack of Copic Ciaos to start her with and I sent her a bunch of links and blogs for her to follow to go along with ones she’d already been following on YouTube. Instead of stamping an image, since she doesn’t have the supplies for that, she’ll be creating her own images herself and then coloring them in with Copics. Can’t wait to see what this 12 year old girl creates! For a gift, I got her a Copic wallet I found by chance since Copic isn’t making them anymore, which I think is a bummer. The wallets are how I started out carrying my Copics and I think they are a great way to start when you have a small collection or even a larger collection because you can have several of the Copic wallets with the various color families. If you are looking for the wallets, try Tuesday Morning, which is where I found this one, or go online and shop around, you might get lucky. So on to the card! I wanted to make her a card using a different coloring medium so I used my Zig Clean Color Real Brush Markers. She’ll still get to see the blending process, but she’ll also get to see another medium used. If you go back on my blog and look at the Slumber Party Invites I made using Copics, they were for her and I made an extra so she could keep one and save it! I think that’s how she fell in love with Copics. I pulled out Lawn Fawn Fairy Friends and Lawn Fawn Critters in the Forest and stamped them with Simon Says Stamp Intense Black Ink onto Bristol paper. I used most of the images from the LF Fairy Friends and only used the mushrooms from the LF Critters in the Forest. The images that hold the lantern, I used Simon Says Stamp Green Leaf Ink to stamp those. I colored all of the images with the Zigs and I will have a list of the colors used at the bottom of the blog post. I did use the Bristol paper for the first time since I’ve seen so many other people online use it and have much better results than with watercolor paper and I was very pleased with the results. I will be using the Bristol paper with the Zigs from now on, that’s how happy I was with the way the Zigs blended on this paper. I used Distress watercolor paper for the background and blended on Broken China Distress Ink for the sky and Mowed Lawn Distress Ink for the grass. I also cut out Lawn Fawn Grassy Border from a piece of the Distress watercolor paper and applied Mowed Lawn Distress Ink. Over both of these pieces, I used the Distress sprayer and waited about 20 seconds for the water to sit on the paper and used a paper towel to pick up the water to give it some texture. Then I cut out Lawn Fawn Picket Fence Border from the Distress watercolor paper and applied Frayed Burlap Distress Ink, but didn’t apply any water to it. Then it was time to put everything together. I used a wet glue so I could still move things if I needed to. I first put down the fence then the grass and pulled up the grassy pieces to give it some texture. I fussy cut out all of the pieces that I colored because I didn’t have the dies to match (the dies will be going on my wish list!) then put all of those down. 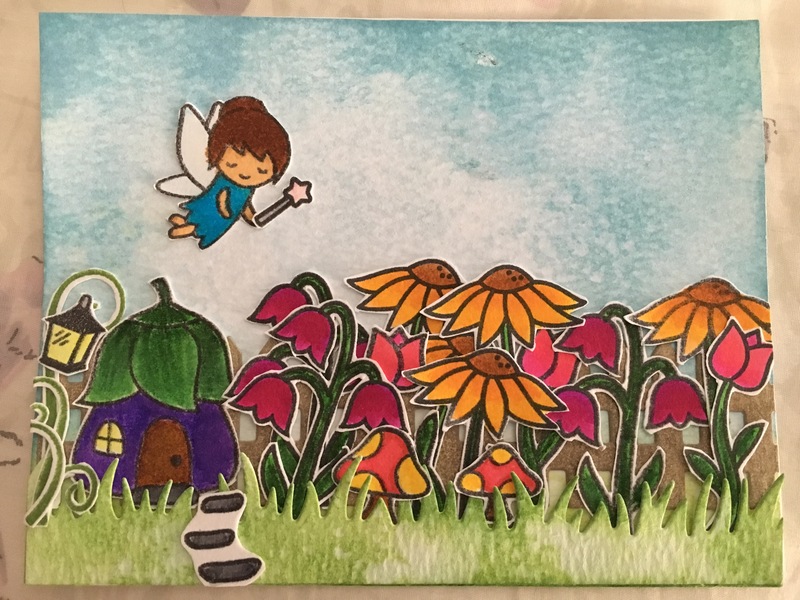 I did use the Spectrum Noir Clear Sparkle Pen for the Fairy wings, her wand and the lantern. I actually put a little of the Zig color down and then blended the color with the Sparkle pen for the wings and the wand. I really liked doing this because it made the colors softer.